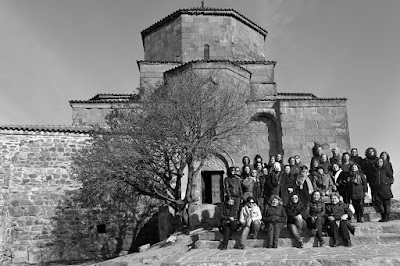 the young network “Women build Caucasus”, unifying ca. 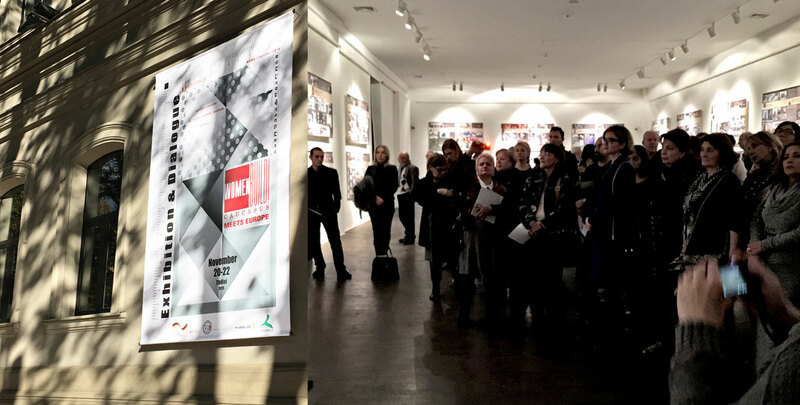 50 female architects from Georgia, Azerbaijan, Armenia; the Reiseuni_lab, connecting 10 universities and professors of architecture throughout Europe and Israel and “n-ails Berlin”, an interdisciplinary network of female planners and architects of Berlin. 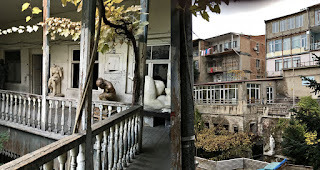 Diversity of the European and Caucasian building culture: similarities and difference. The exhibition documented the architects’ work, their positions and careers and illustrates the architectural contexts and features of the grown European culture between Eastern and Western Europe and Caucasus. 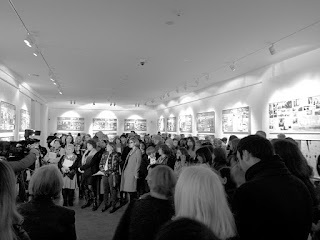 Since 1960, the widely spread compiled contribution of the participating female architects of 8 countries to building culture has become visible over several generations: All professions of the field ranging from the building architect, urban planner and designer to the researcher, teacher and specialist in construction have been represented. Each participant has shown her individual work within the context of cultural and political influences and presents additionally with her “biographical background” another female architect who has been an influential personality throughout the architect’s professional career or life. Tallinn University of Technology has been represented in Tiblisi with 3 professors of architecture and sociology: Dagmar Jäger has been responsible for the concept of the exhibition and conference day, Katrin Paadam has hold the closing address & Irina Raud participates with an exhibition poster. Further participants of Reiseuni_lab: Inken Baller, Berlin; Maria Schneider, Innsbruck; Marusa Zorec, Ljubjana and Mar Loren, Sevilla. 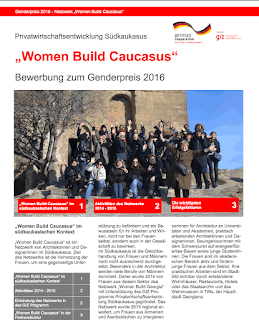 2015-11-20 Women-Build! Caucasus meets Europe. Architectural practice has to deal with complex problems today: transformation, densification and re-valuation of urban areas are important actual challenges. What are relevant fields of re-thinking cities within or beyond the limits of growth? How do phenomena such as the never-ending urban sprawl, social integration or the de-industrialization affect architect’s profession? How do we re-activate neglected urban areas or built heritage for next generations? Six positions between Caucasus and Europe serve to discuss our professional challenges and expectations. 2015-11-20. 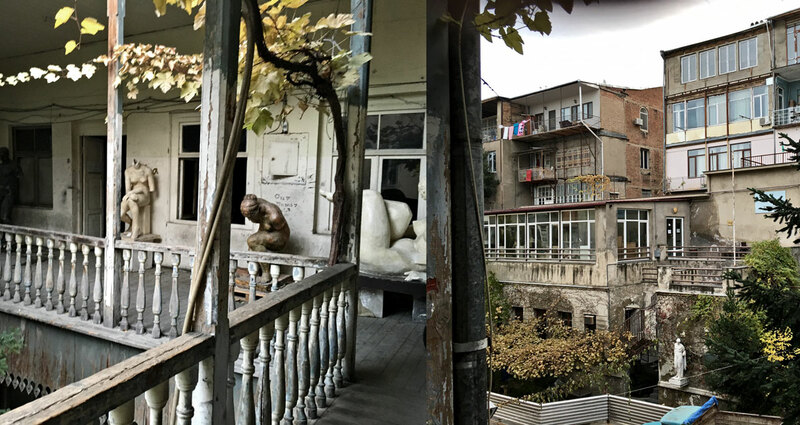 Lecture at Tbilisi, State Academy of Art, Georgia – Programme Director Dagmar Jäger has been invited by Prof. Nana Kutateladze, to introduce the Georgian BA finalists of Architecture into the Reiseuni, its teaching and research aims at TTÜ. The large university reform has lead to a multitude of discourses about quality, about new approaches and concepts in all academic disciplines from Western to Eastern parts of Europe and Caucasus. Architectural education and research is traditionally routed in project-oriented studio work about relevant problems of the society. What is the responsibility of the academic world in nowadays’ knowledge production, facing social and financial crisis throughout broader Europe? How do innovative academic models might inspire the professional landscape? And: Which are actual demands of research and education for architects today? More than 100 years of academic education have lead to a multifaceted international landscape of women’s contribution to the built environment: Female architects act in all fields of practice and theory today – the discourse landscape about the specific role of female architects has been developed since decades. Even though, statistics about income, leadership quota or living realities of everyday life still manifests a potential of further development. And: The female practice within different political contexts of democratic and former socialistic societies in a broader scale of Eastern and Western Europe as above mentioned represents a younger field of investigation. The exchange between the networks of Caucasus, Berlin and Europe shall enrich this debate. The project is an initiative of the newly created network “Women build Georgia”, launched in 2014 with the support of the Private Sector Development Programme in the South Caucasus which is implemented by GIZ on behalf of the Federal Ministry for Economic Cooperation and Development (BMZ). Dagmar Jäger (Reiseuni_lab, n-ails), guest of the first symposium in 2014, has developed the concept of the exhibition and symposium in 2015. The Reiseuni_lab is an interdisciplinary architectural research network that has been connecting cities and 10 universities in productive cooperation and exchange between Technical Universities, Schools of fine Art, non-academic Institutions, University Faculties and postgraduate students since 2008. Today, the lab consists of about 40 active members, professors and alumni in 17 countries of Europe, USA and Asia. Field of Work: Sustainable residential and social projects within the existing of urban contexts; consulting in urban design and building in context, supervision of PhD and MA degree, organisation and supervision of academic workshops, participation at conferences, jury member in architectural competitions. Mar Loren Méndez, Architect, Dr. BArch. MArch. Ph.D.
Memberships: Co-coordinator of the CIB (International Council for Research and Innovation in Building and Construction), W069 'Residential Studies'; member of the Scientific Advisory Board of AIDAH 'Architectural Inventions for Dwelling, Ageing and Healthcare' at Chalmers University of Technology; Sweden, 2014-2018; member of the European Sociological Association; member of the Estonian Union of Sociologists. Field of Work: Sociological and interdisciplinary urban and residential studies; research on the construction of identities in urban and residential contexts; biographical research (individual residential and professional histories); qualitative methods in urban and residential research; lecturing on urban and residential sociology, sociology, theory of practice, qualitative methods. Maria Schneider, Univ.-Prof. Arch. DI Dr.
Function: Univ.-Prof. at the Institute of Urban + Regional Design at the Faculty of Architecture, University of Innsbruck; Member of the Curricular Committee at the Faculty of Architecture; Member of the Academic Senate at the University of Innsbruck; Member of the programme „European Architecture“. Memberships: Member of “Chamber of Architects and Consulting Engineers, Austria”, Member of Supervisory Board „Neue Heimat Tirol“, Member of Advisory Board „Raumordnungsbeirat Tirol“; Member of Curriculum Committee, TTÜ, MA European Studies. Field of Work: Sustainable development and design of urban and regional structures and landscapes, interdisciplinary projects, architectural projects. Field of Work: Sustainable development and design of urban structures and architecture, planning housing estates, cultural or business venues such as Ugala Theater, urban planning projects in Tallinn, with the key goal of “connecting the organic with the urban landscape”. Founded in 2004 in Berlin, n-ails e.V. today has 28 active members of architecture, planning and landscape architecture. The aim of the network is to support the creative, interdisciplinary and professional exchange and cooperation. The foundation creates a platform for political involvement & exhibitions. In Germany, female architecture foundations are organized each in the federal countries, but in exchange via round table and symposia since a couple of years, aiming to unite. Memberships: n-ails, B-EN, ski – stadtkultur international, E.F.E.U.